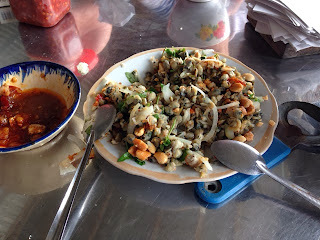 I had the opportunity to try this delicious dish in Hoi An. The baby clams were fresh picked from the river earlier that morning. The meat was so sweet and firm, not something I can find at home. The clams were lightly sauteed with no seasoning just some fresh onions. It was eaten with rice cracker and mam nem (fermented fish sauce). Even though I was already full from breakfast and lunch, I pretty much inhaled a plate within 3 minutes. Whenever I make this at home, I usually have to settle with canned clams or frozen clams. While it no longer has its natural sweet flavor, I still prefer using frozen clams because it has better texture than canned clams. I use fresh minced garlic and shallots to help fragrance the clams and just a tad of fish sauce to season. I also like adding some julienned green mangoes for tartness and freshness. For the sauce you'll want to dilute the mam nem with fresh lime juice, sugar, crushed garlic, and fresh chili. 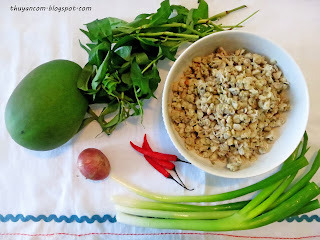 The sauce can be eaten on the side but a lot of times I just mix some in because everybody in my family loves mam nem. 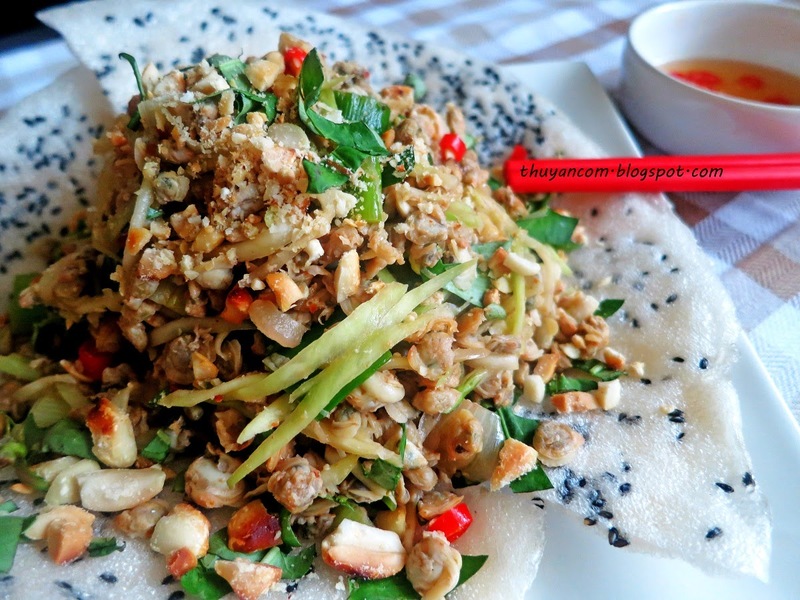 If you prefer to omit the mam nem, I would use more fish sauce when seasoning the clams. 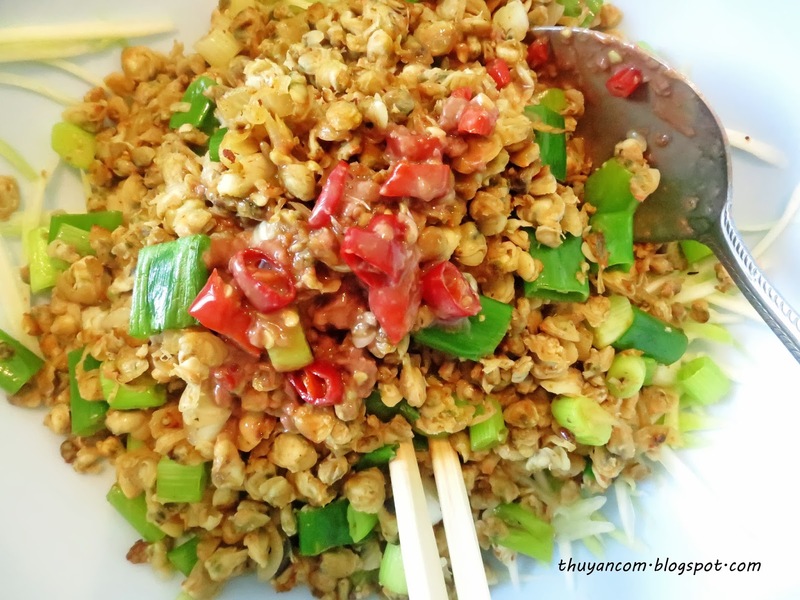 Of course this dish cannot be complete without Vietnamese coriander (rau ram), crushed peanuts, and fresh chili. Enjoy! 1. Thaw out the frozen clams. The clam has absorb a lot of water you'll want to squeeze out as much as you can. 2. Heat up cooking oil in a pan. Add the minced garlic and shallots and cook until fragrance. Add the clams and green onions. Season lightly with fish sauce and sugar. Transfer to a bowl. 3. Prepare mango, coriander, sauce, rice cracker, peanuts. 4. Add green mango and fresh chilies to the clams and toss. At this point you can add prepared mam nem or serve it on the side. 6. Scoop clams with rice cracker and enjoy!